ARE YOU A LEADER? AFP San Diego wants you on one of our committees! Our chapter is a dynamic association celebrating philanthropy in San Diego and promoting ethical and effective fundraising. We have a number of committees dedicated to carrying this mission forward. Whether you have developed skills to share or you wish to learn new ones, you are invited to join us. Interested in helping spread the word about all AFP has to offer? The Community Relations Committee is a dynamic group that manages the chapter’s overall communications and public relations, working in concert with all other committees to publicize and promote AFP activities. If you’re interested in the education offerings AFP has to offer, including selection and recruitment of speakers, monthly meetings, and workshops, please consider getting involved with an Education Committee. There are many opportunities to volunteer based on your areas of interest, and stage of your career. The Finance Committee works with the Treasurer to ensure we are good stewards of our chapter’s financial resources. We help our fellow board members budget for programs and other needs, make investment and banking recommendations, provide oversight, and generally ensure all our financial needs are met. Are you interested in increasing diversity for significantly underrepresented groups in our profession? Increasing diversity in programming? Increasing diversity in AFP San Diego membership and assessing areas where diversity can be improved? Then come join the Diversity and Inclusion Committee! AFP San Diego is excited to build a strong community committed to equity, diversity and inclusion. We invite you to join our community and share your ideas on ways to make our chapter even stronger. 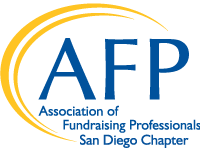 If being a member of AFP San Diego has advanced your career, consider joining our chapter’s membership committee to help educate other professionals about membership’s return on investment, and to help new members get the most from joining our chapter. Mentoring is a direct person-to-person sharing of knowledge and expertise and it’s one of AFPSD's most valuable services. Come help the mentorship team recruit new mentors and mentees while supporting those already in the program. All hands on deck! The production of National Philanthropy Day (NPD) is no small feat. Each year a group of committed individuals come together to coordinate this special celebration of philanthropy in San Diego. Whether you are a seasoned special events coordinator or someone who wants to learn some of the tricks of the trade, we need you around the table! Each year AFPSD unites with organizations and individuals to celebrate the love of humanity, to acknowledge the importance of local philanthropy and the powerful change it brings, and to honor those who dedicate their lives to creating a better San Diego through philanthropy and volunteerism. If NPD has inspired you or renewed your passion and dedication to your work, consider joining our chapter’s NPD PR/Communications Committee to elevate our strategic communications process and help make NPD 2019 the best one yet! 3. Colette M. Murray Fellows Scholarship - The Colette M. Murray Fellows Scholarship is an outreach initiative of the AFP San Diego Chapter to encourage diversity within our profession by offering incentives for AFP membership to persons who are members of a diverse community and/or those working for nonprofit organizations in San Diego County serving diverse communities. If you are a development professional with 10+ years of experience, consider joining our chapter’s Senior Network of Advancement Professionals. SNAP! programming focuses on topics relative to advanced fundraising professionals and serves as a resource to advance San Diego's nonprofit and philanthropy in the community. Join us! If you love stewardship, celebrating philanthropy at National Philanthropy Day, and making others feel good about investing in best practices for fundraisers in our region, then the Stewardship Committee is the place for you! AFP San Diego hosts audio conferences produced by AFPI throughout the year. These varied and timely presentations offer something for the seasoned fundraiser or someone new to the field; large shop or the development department of two. This committee coordinates the monthly presentation and facilitates the post-conference discussion. AFPSD is committed to helping those earlier in their fundraising careers move successfully forward into the field. Connect with other young professionals, mentors, and develop expertise as a part of this team.